The front LED on a My Cloud Mirror, My Cloud Mirror Gen 2, and My Cloud EX2 storage device is Solid Red. This behavior is by design and can be caused by many factors. 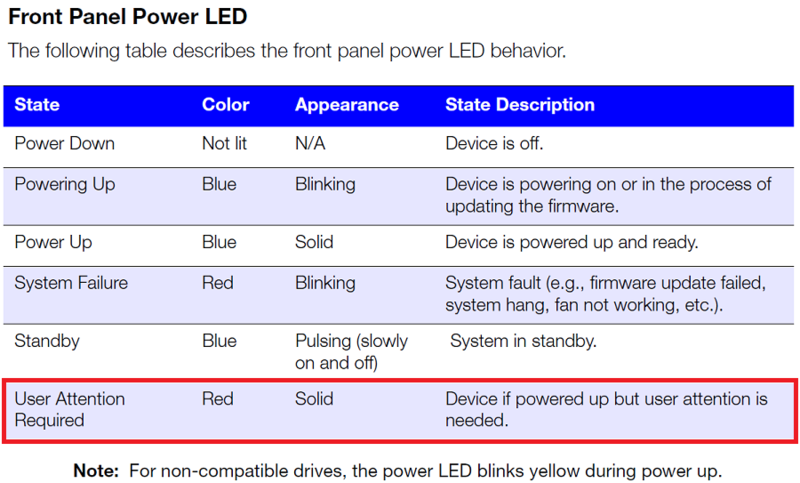 The LED will remain Red until the source of the issue is corrected. The following table describes each factor with a possible solution. For a complete list of LED Status on a My Cloud, please refer to Answer ID 16771: My Cloud Alert Codes, Descriptions, LED Status and Email Notifications. Open the Dashboard of the My Cloud device. If the Dashboard is accessible, proceed to step 5. For assistance accessing the Dashboard, please see Answer ID 10420: How to Access the Dashboard on a My Cloud Device. Check that both LEDs, on the Ethernet port behind the device, are illuminated and the top LED is flashing. The top LED indicates when a connection is made. Ping the IP address of the My Cloud device to validate that a connection can be made from a computer in the same network. If no connection could be made, please reboot the device and try again. Verify the alerts on the Dashboard of the My Cloud device and resolve if needed. Once resolved, clear the alerts. Remove all external USB devices attached to the My Cloud device. Check the UPS status, if applicable. A main power loss will result in the UPS alerting the My Cloud device with a solid red LED. Verify that the volume is not at or above 95% full. If so, please move data on the volume to another external location to free space. Perform a Quick Test, under System Diagnostics, via the Dashboard. For assistance performing a System Diagnostics test, please see Answer ID 10427: How to run a System Diagnostics test on a My Cloud. Reboot the My Cloud device.